We are the company that offers full range of services in assessment, training and development of corporate personnel at all levels. We are proud to have been entrusted by more than 350 of the largest Russian and multinational companies with the assessment, training and development of their regular employee force and management cadre. For over 20 years STI (Solutions.Tools.Ideas) have been specializing in the production and delivery of long-term development programmes for the corporate sales force, service staff, key account and line managers. Apart from developing specific soft skills we design performance standards for sales foce and service, help to transform sales process into competitve advantage using both our own and licensed technologies. We are certified professionals and besides our local products we represent in Russia licensed products of such renowned specialists as Cesim™, Hogan™ and Success Insights™. Some of our partners' products, namely Infoteam's™ Leading the Sales Process and Winning Complex Sales we represent on the terms of exclusivity. The geography of our successfully completed projects is spread from Vladivostok in the Far East to Kalingrad in teh West and from North to South covers Kazakhstan, Ukraine, Azerbaijan, Georgia and other CIS countries. 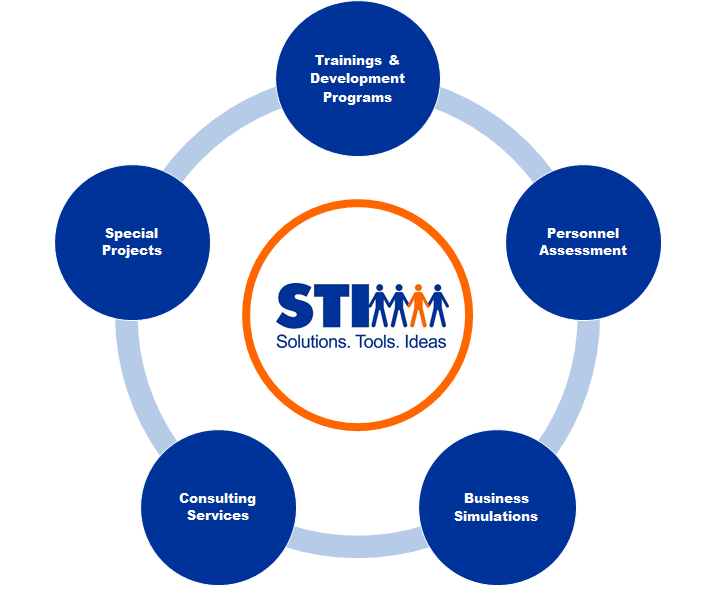 We enjoy being in the training business and therefore our key priorities will forever lie in continuous diversification of STI's product portfolio and achievement of absolute customer satisfaction with the quality of our service.